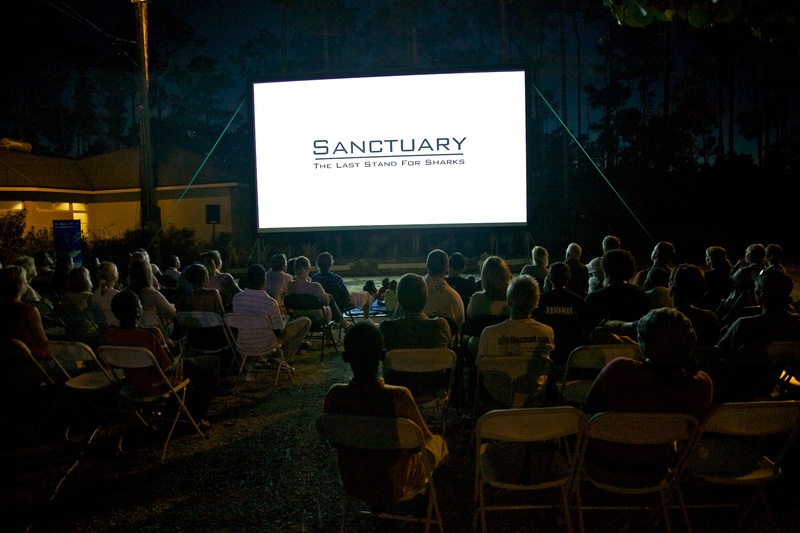 In fall of 2011, we finally got to field test our Ocean Outdoor Theater. Our team was contracted through the Pew Environment Group to produce a shark conservation film addressing the issue of global shark finning, the important role of sharks in the environment, and the growing movement to protect them. This first shark film, designed to be part of a series, was focused on the Bahamas, which just passed legislation in summer of 2011 which designated their waters a shark sanctuary. The theater, which comprises of a 24-foot wide screen, a 10,000 lumen bluray projector, and full sound system, definitely held people’s attention. On a 24-foot screen the Tiger Sharks looked larger than life and few could deny the charisma or power of these animals. The trip was an amazing success! We traveled to three different islands, each day packing the gear into a tiny plane, hopping to the next island, unloading the gear, then transporting it to the next site. By the end of the trip we could set up and take down the theater in just a few hours. 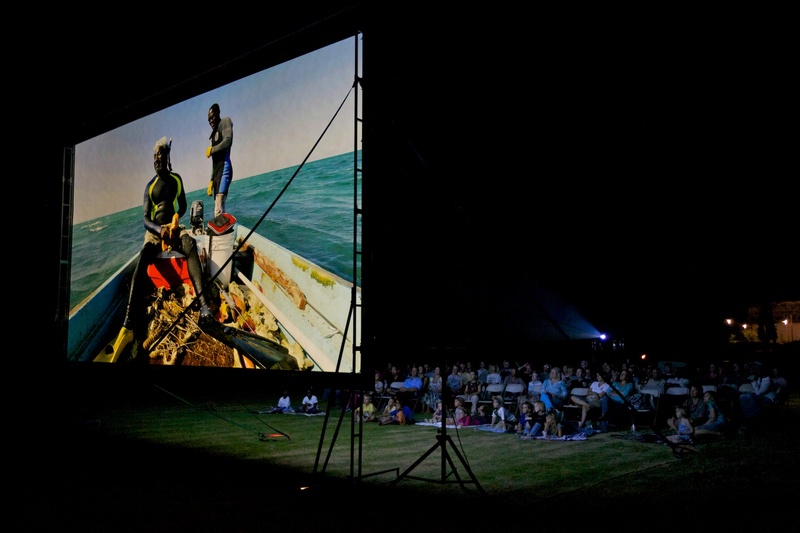 Next location for promoting shark conservation with the Outdoor Ocean Theater: Micronesia! After our days in the villages, we returned to Misool Eco-Resort for some wrap up interviews and photography. 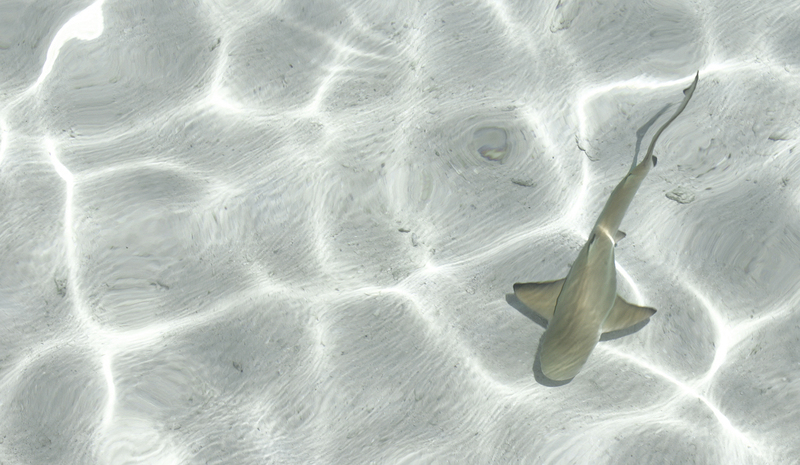 During my final afternoon, I stood waist deep in the crystal clear water as baby blacktip reef sharks circled me. Their charcoal dipped fins barely broke the surface as their bodies moved and blended with the white sand below. Ten, then fifteen, then twenty sharks streamed through the water just inches from me. The sharks paid me little attention, as they were busy hunting schools of scad, silvery fish with big eyes (which seemed to grow even bigger as the sharks approached). The sharks worked together, sending the fish scattering and regrouping. Suddenly there was a massive splash as the sharks chased the scad up the beach, hoping to snare one in the shallows. Not this time though, the scads managed to dart back down the sandy decline and the sharks resumed their attentive hunt. In 2005, when Andy Miners, founder of Misool Eco Resort, first came to Batbitum (the island where the resort now stands) he found the remnants of a shark finning camp. The tiny fins he saw lent evidence that the island’s bay was once a shark nursery ground. Yet, as he dove the area, he didn’t spot any adult sharks nearby, nor a baby shark in the bay. 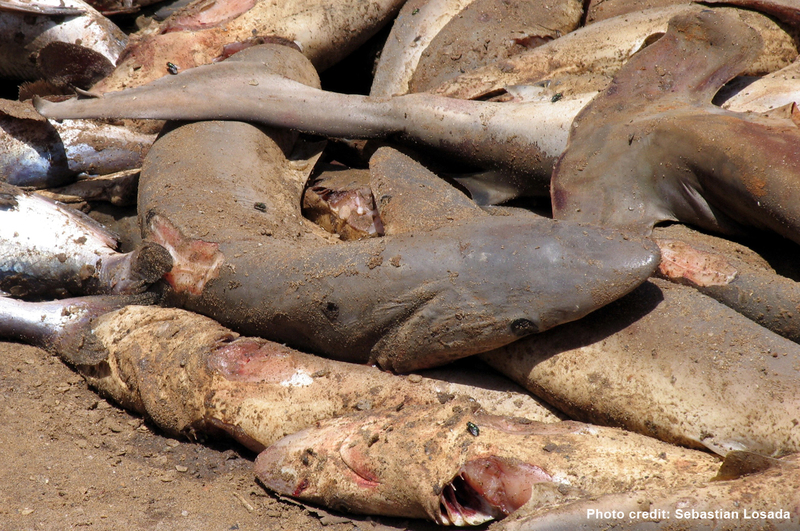 Years of shark finning had devastated shark populations in the region. Miners hoped that the sharks would return in 10, maybe 20 years. 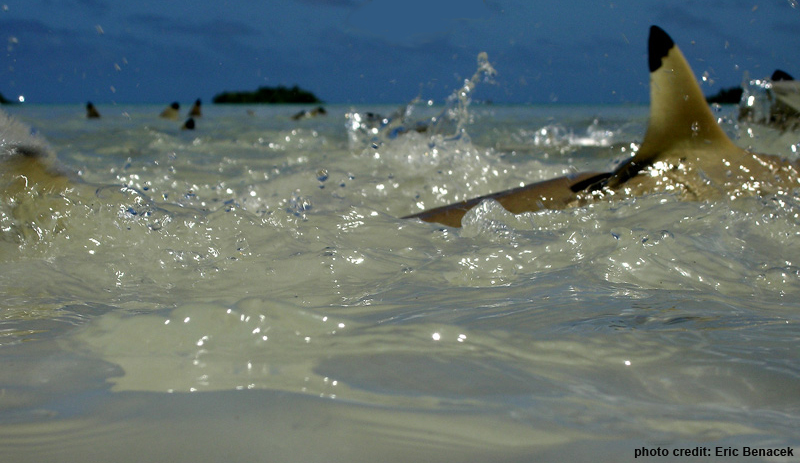 But within only a few years of setting up the eco resort, which included a substantial no-take marine reserve, a baby blacktip reef shark was born in the bay. Last year, the bay harbored a dozen baby sharks, and this year more than twenty. 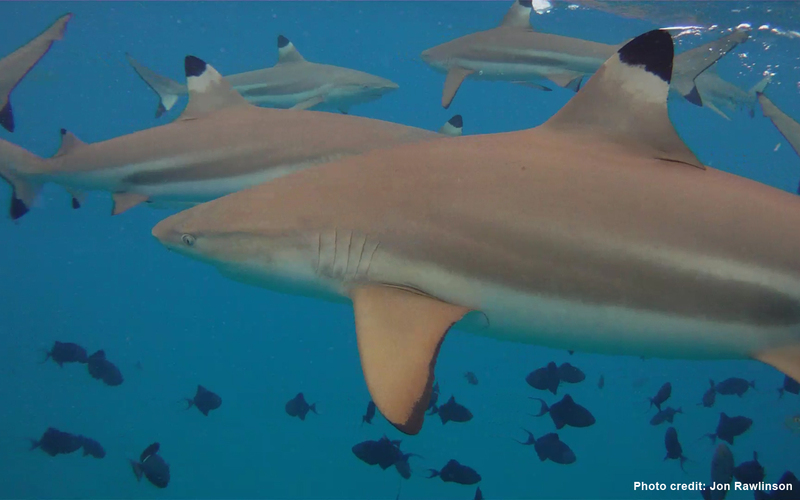 The transformation of a shark finning camp to a marine reserve and the rapid return of baby blacktip reef sharks is a true testament to the resiliency of marine ecosystems. Knowing these young sharks will go out and populate the waters of Raja Ampat lends hope that despite damage from destructive fishing practices and increasing foreign fishing pressures, Raja Ampat can and will recover. But there is still so much work to be done. To find out more about how you can help our efforts in Raja Ampat, send me an email at lastoceanproject@gmail.com or make a donation to the project. Thanks for reading! Stay-tuned for more. Arriving in the villages with our 250 pounds of gear caused quite a spectacle. When I pulled out my audio equipment and headphones, the kids broke into an excited frenzy. Some exclaimed that I had a bomb. When I handed them the headphones to listen, they giggled at the amplified sounds and voices, realizing it was only a strange looking microphone. When we set up the camera for landscape shots, the village kids wanted to simultaneously be in front of the lens and behind it. They followed us in the streets and piled in the doorways of the houses we stayed in. Every moment we were in the villages, the kids watched and studied us as if we were something between celebrity and circus freak. It wasn’t only our strange gear, but two of us had light skin, which caused even more commotion. Little girls starred at me while daring each other to touch my arm or pull my braids (and then within an hour, they were braiding their own hair). Babies cried when they saw me, I looked so strange to them. Unlike wary westerners, people let us into their homes with refreshing ease. There was always fish and rice to eat and a floor to sleep on. They let us set up our crazy travel studio in their homes, were eager to converse about life or politics, and open to our interviews. But all of this happened at a snail’s pace. 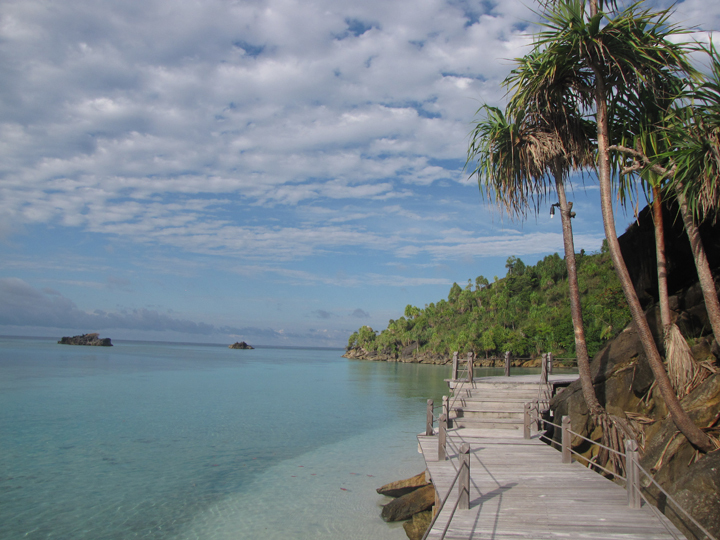 Upon stepping foot in Raja Ampat, we had to let go of our impatient and spastic western ways. 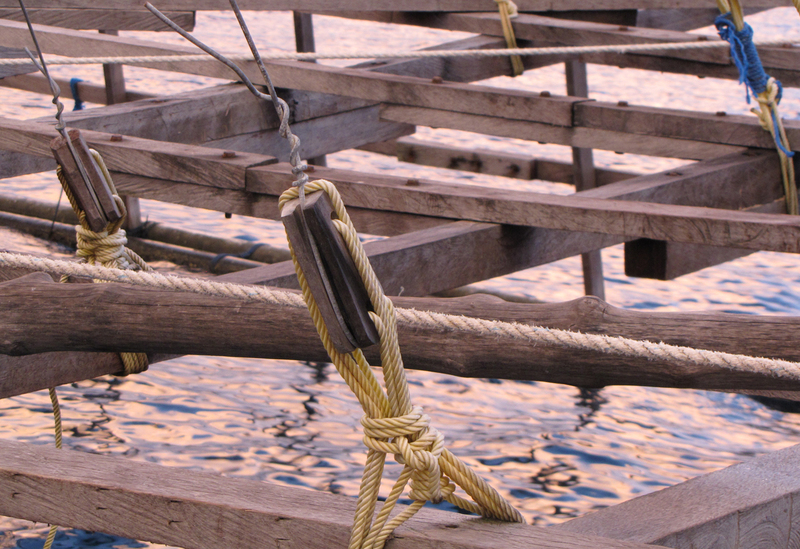 Often times we had to wait for days before making arrangements, whether we were trying to go out on a fishing boat or set up an interview with a village elder. When we pressed for something to happen faster, the response we usually received was besok, which means “tomorrow.” Today there was ample time for sitting, smoking cigarettes and drinking too sweet coffee. While frustrating at times, we soon settled into this sluggish pace (minus the cigarettes) where our modern communications technology got us nowhere. I embraced it, knowing that too soon we would return to the chaos of our normal lives. 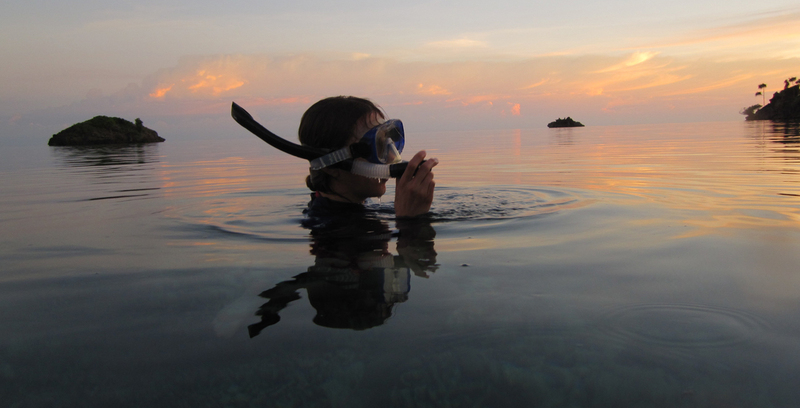 Traveling to Raja Ampat takes almost as long as a trip to Antarctica and feels almost as remote. From San Francisco we flew west for three days, finally reaching Sorong, Indonesia, the gateway to the Raja Ampat Islands. There we boarded a boat and made a four-hour journey to Southeast Misool, passing only a boat or two along the way as we approached the seemingly endless chains of dark jagged islands. At first glance, the rugged islands seem uninhabited, but a closer look would reveal 100 or so villages scattered throughout the region, primarily on the few islands level enough to erect simple homes. We visited two main villages in Southeast Misool to gather interviews with the people who live there, documenting their relationship to the ocean, including changes they’ve seen in the marine environment and their hope for the future. We inquired about their experience in partnering with Misool Eco Resort, and had discussions about how to boost economy while sustaining local resources. Our time in the villages revealed the incredibly complex pressures facing the marine environment and those who depend on it. In Yellu, the first village we visited, trash piled in the streets and decayed in heaps along the water line. 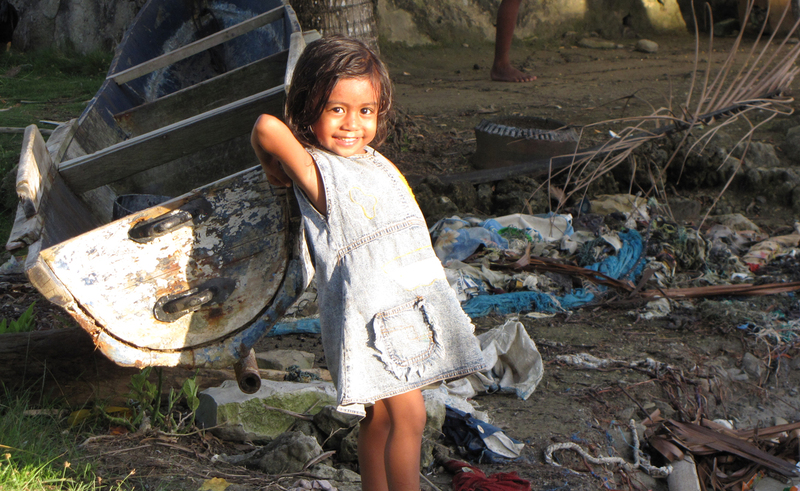 All of Indonesia lacks the infrastructure to deal with waste. The solution in Raja Ampat is to simply throw garbage in the ocean, where a storm surge or current will eventually scatter it, littering beautiful beaches and poisoning marine life. The waters surrounding Yellu were murky and devoid of life. 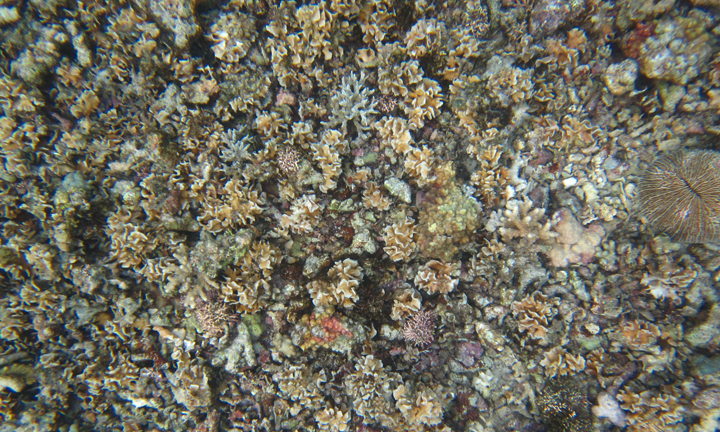 Silt smothered the corals. Only a spattering of trees remained on the hillsides. Houses filled every inch of flat land and then spilled out across the water. Depending on who you ask immigration rates vary, but many suggest that Yellu has transformed from a quiet town of only a few hundred to a crowded and polluted village supporting almost 2,000 people. Half of those newcomers came to Yellu to work in the oyster pearl farms – a relatively new but booming industry that’s drawing outsiders to Raja Ampat in droves. While in Yellu, we photographed and interviewed artisanal fishermen who gather their catch with simple nylon handlines from dugout canoes (some with modern sputtering motors). 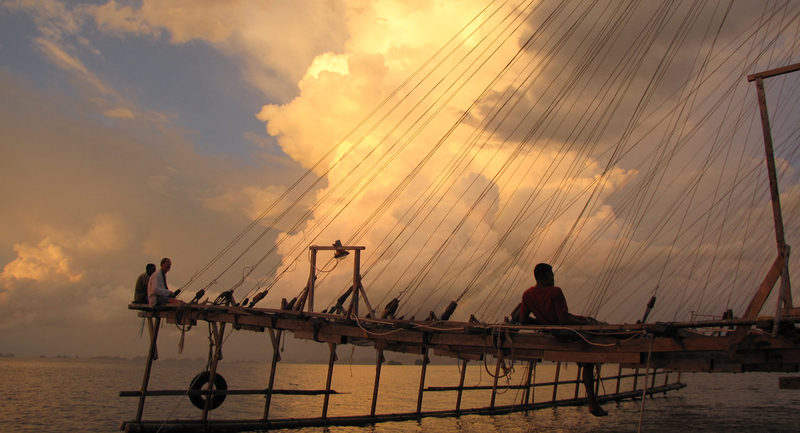 Historically fish were caught for local consumption, but now many fishers have now been lured by the lucrative live fish trade. They seek out the biggest groupers and wrasse, which bring the greatest profit. 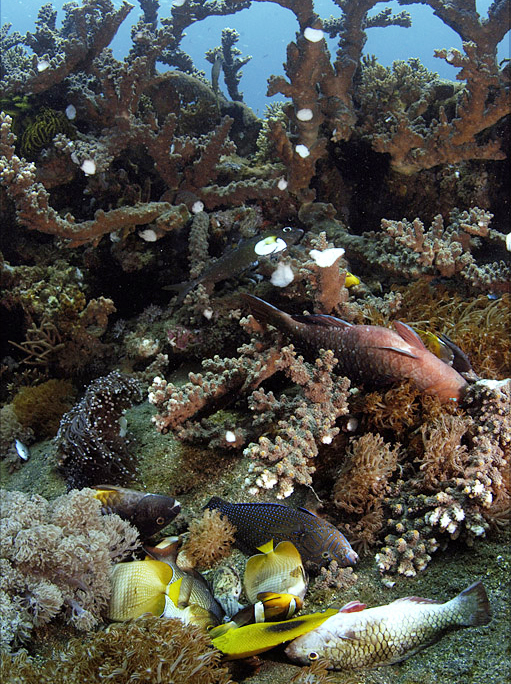 But these targeted efforts have diminished local fish populations. 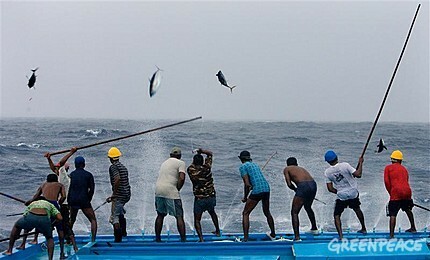 Fishers have to travel further and further to get an adequate supply. Once caught, the fish are stored in crowded ocean pens and injected with antibiotics to stave off infection. 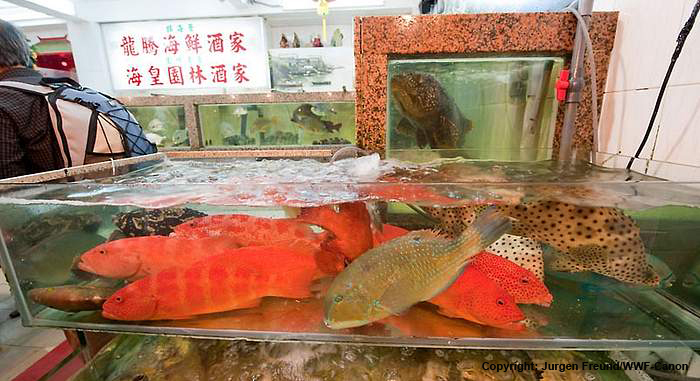 Once a month or so a ship from Hong Kong arrives, scoops up the penned fish and returns to sell them as “fresh” caught fish in the Asian live fish trade. Raja Ampat has remained lush and intact largely through supporting a historically small population size, roughly 35,000 people in a region about the size of France. 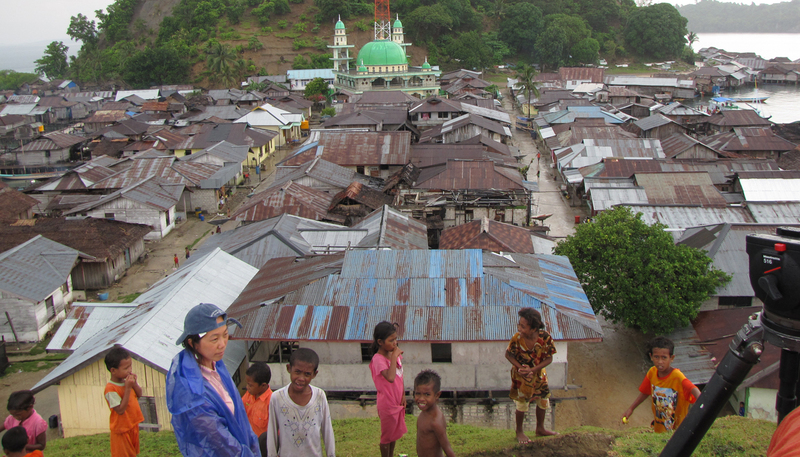 But it has turned into one of Indonesia’s fastest growing regions. Now Raja Ampat must support this burgeoning population, growing at more than five percent a year, and a global fish market. 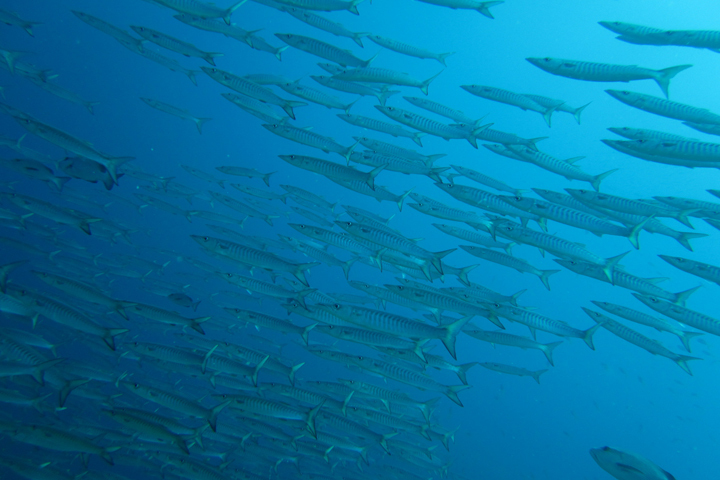 We can look to the boom and bust trends of most global fisheries to realize the outcome. The environment and all those who depend on it will surely suffer. But not every village has succumbed to these foreign interests. In Fafanlap, a village just one half hour from Yellu, locals still handline for subsistence fishing only. Oyster fishers have yet to settle in. Fafanlap supports one-third the population of Yellu. 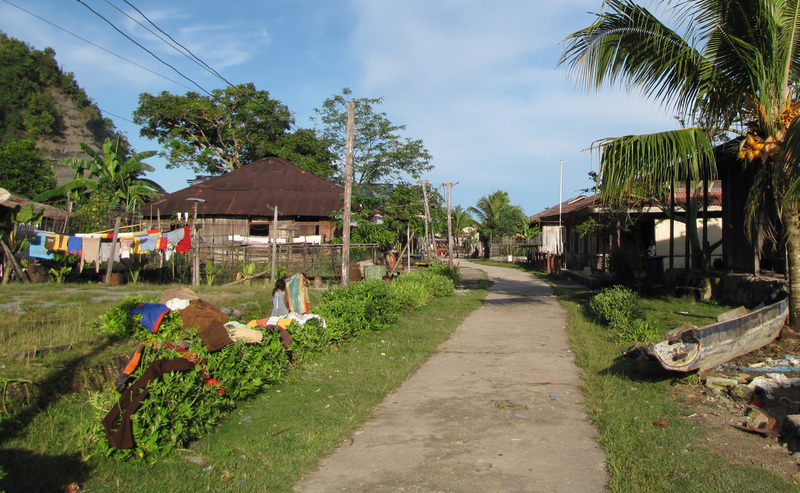 There’s less trash in the streets, the waters are cleaner and lush tracts of virgin forests surround the village. New economical pressures possess incredible power and the outcome is uncertain, but we left the villages feeling inspired. 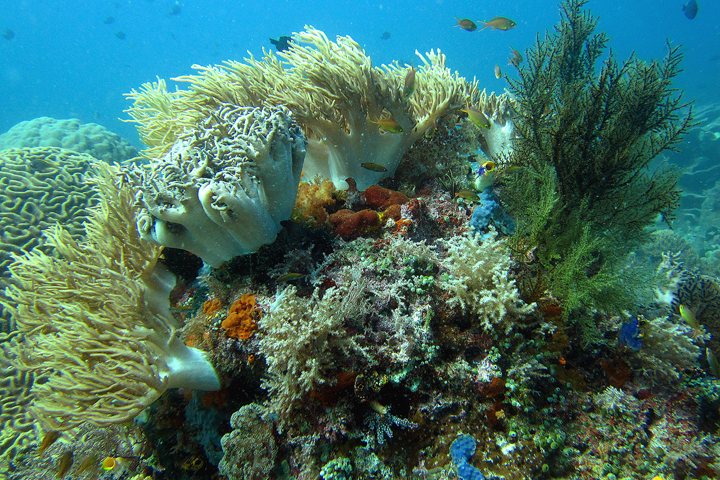 Raja Ampat harbors intoxicating beauty and unparalleled biodiversity. 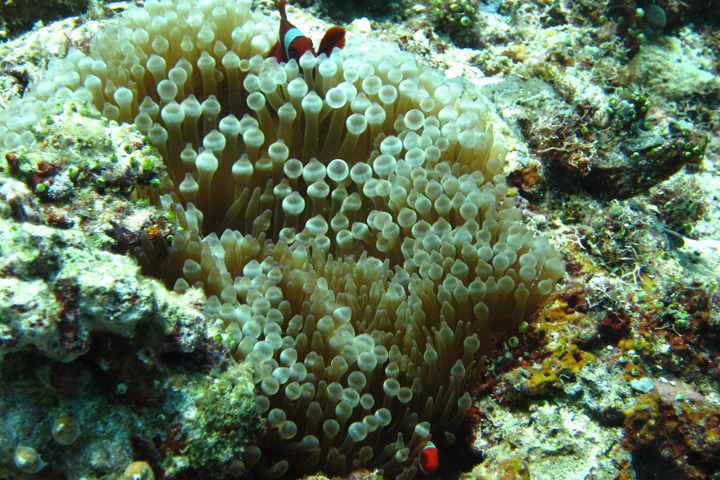 Under Hak Adat, every village has ownership of their local ocean. Our interviews uncovered a deep pride attached to that responsibility and a knowledge that marine resources are not inexhaustible. People were eager to use their rights to find ways to protect their waters for generations to come. We’re doing our best to convey and contribute to that effort. 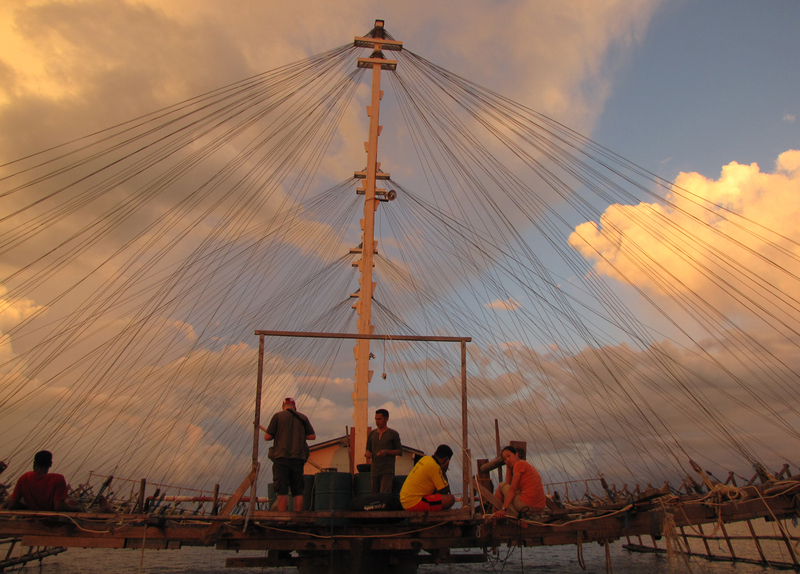 As marine resources become depleted elsewhere in the Indo-Pacific, fishers have pushed into Raja Ampat, the island group off of Papau, Indonesian’s easternmost territory. 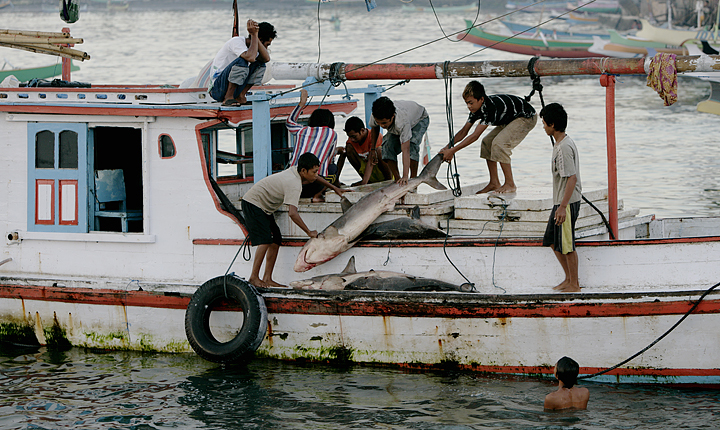 Dilapidated boats, carrying kilometers of long-line to catch sharks for the shark fin industry, or dynamite, the efficient but highly destructive tool of shortsighted Asian fisheries, are a constant threat. 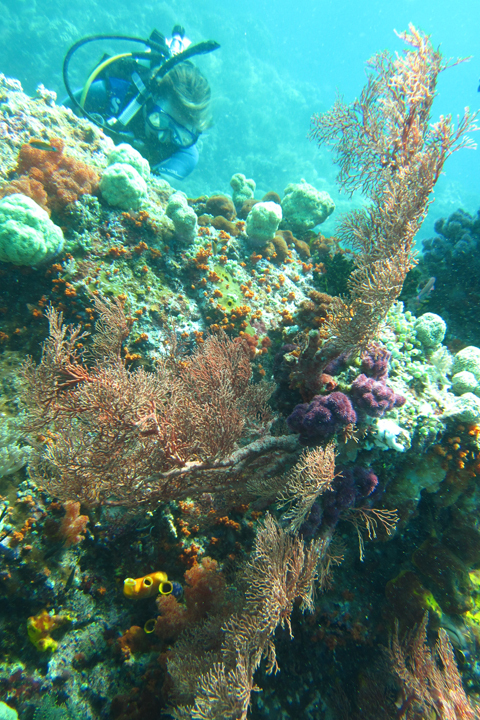 Already, sharks are scarce throughout the region and large expanses of reef have been blown to bits. But these outside fishers have no legal permission to be there. 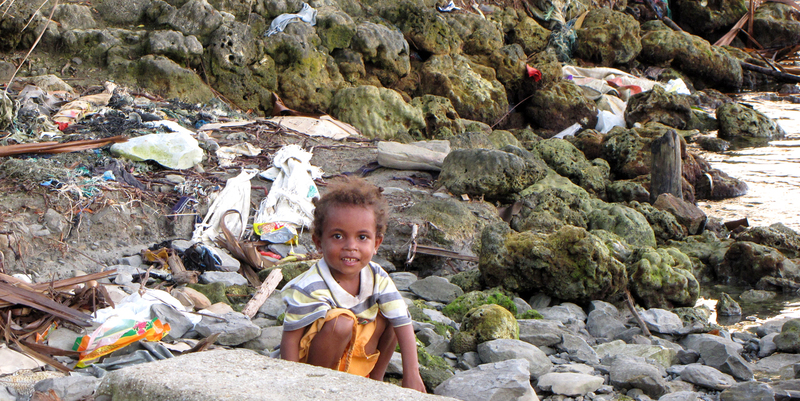 Papuans have traditional economic rights to their marine resources, a law referred to as Hak Adat. 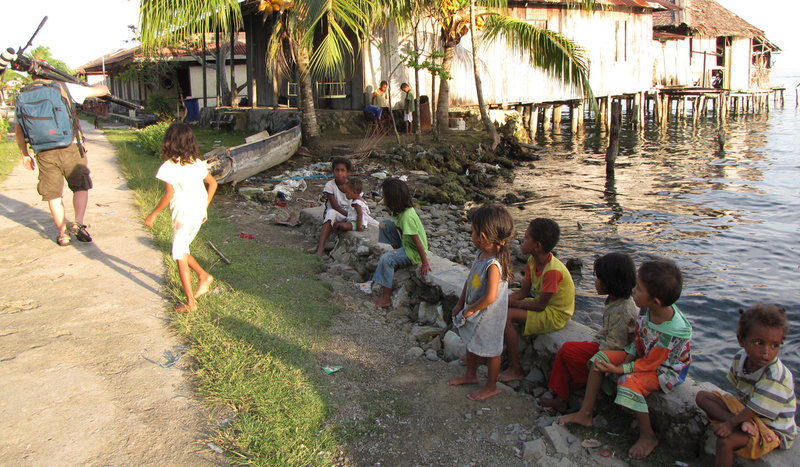 Each of Raja Ampat’s 100 villages has exclusive claims to and responsibilities for a specific swath of ocean. For thousands of years, locals have managed their waters in the sasi tradition, keeping key biological areas off-limits during specific times of the year to ensure the villages will have fish well into the future. 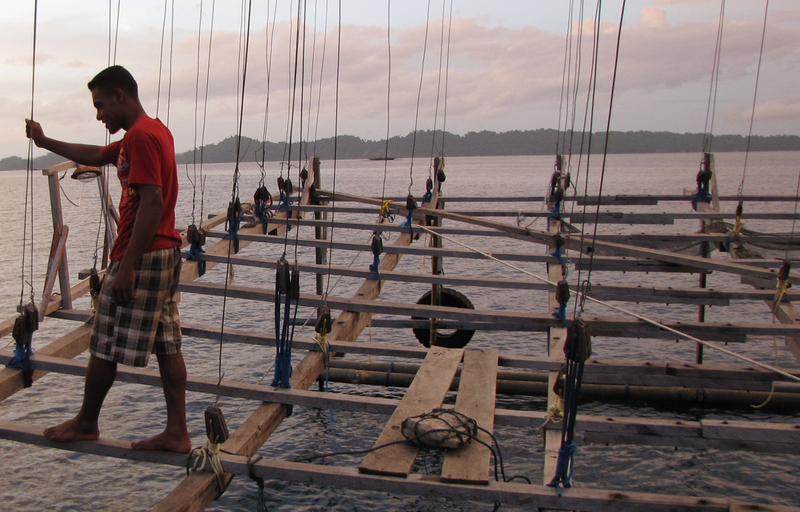 As increasing foreign fishing pressures threaten to overwhelm sasi, a handful of villages in Raja Ampat have joined forces with international non-governmental organizations keen on protecting Raja Ampat’s rich biodiversity. Together they are developing new conservation strategies. 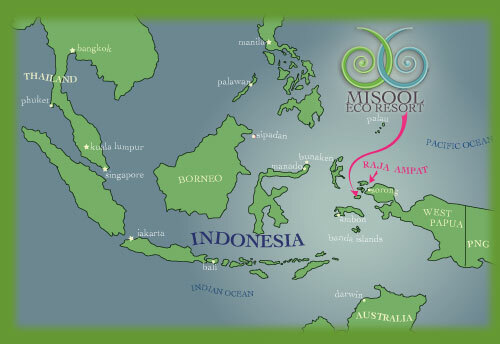 During our trip, we worked with Misool Eco Resort and their affiliated non-profit Misool Conservation Centre on Batbitum Island in Southeast Misool, Raja Ampat. 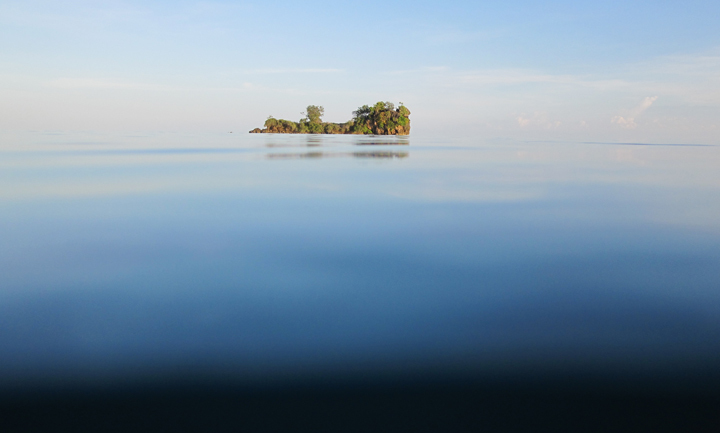 In line with the sasi custom, Misool works with local villages, leasing their traditional waters as a no-take marine protected area. 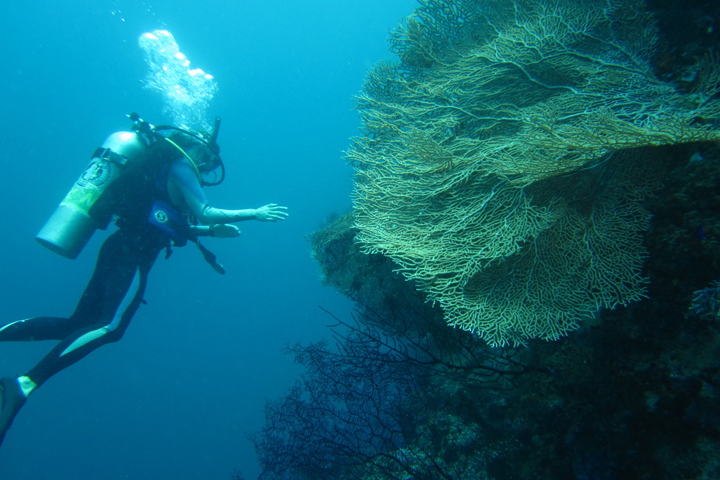 The resort brings in tourist divers from all over the world which generates revenue to employ locals in the resort and as rangers out patrolling the marine reserve. When poachers are found, their gear may be confiscated and, depending on what they’ve been fishing for, they’ll be escorted to the village to pay a hefty fine. THE OCEAN SUPPORTS all life on earth, including our own. The vast majority of evidence suggests that our current ocean resource management is unsustainable and, as these vitally important ecosystems struggle to adapt to a changing climate, we must quickly address the ways in which we overexploit and damage our remaining marine resources. 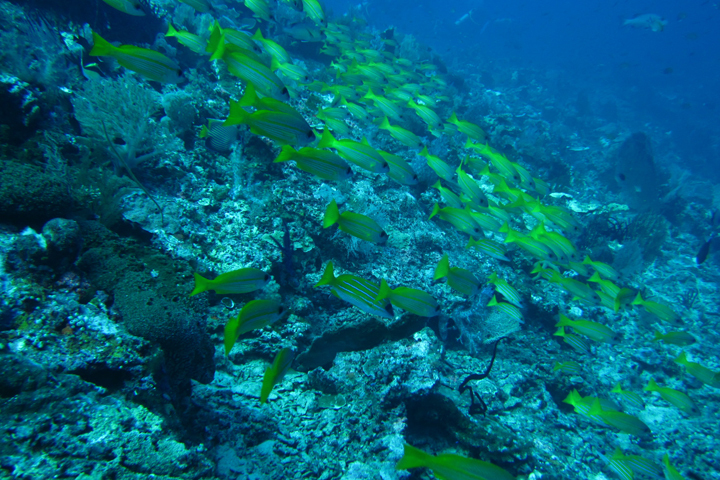 Every one of us has a personal stake in the fate of the ocean; in some cases the connection is so immediate that human survival depends on it. 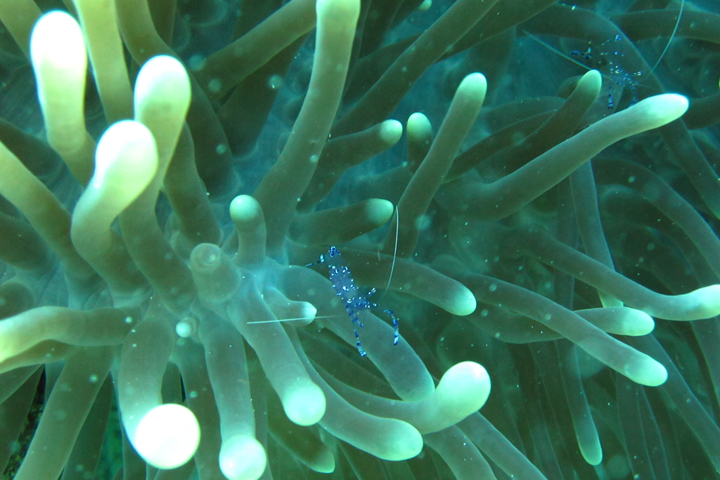 OUR CONNECTION to the ocean is borne from primary emotional experience – a tiny blenny with its oversized eyes, peaking in and out of a hole in a brain coral, inches from your mask; the smell of salty spray as a minke whale surfaces alongside a zodiac on slack seas; fire-red sunset waves rolling up onto a beach. But the vast majority of people might never have the opportunity to witness these marvels. And without these direct experiences, the ocean is just an abstraction; the dire state of marine systems, and the multiple ways in which we are all personally tied to the ocean, remain completely unimagined. We can’t bring people to the ocean en masse, but we can create an experience that brings the power of the ocean to them – an experience that fosters intimacy, connection, and ambassadorship. 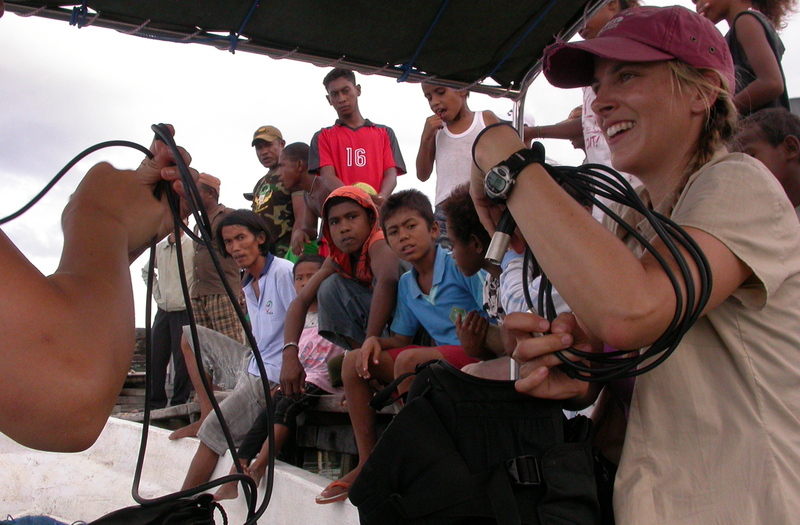 Empowers people by giving them access to the global conversation surrounding ocean issues. The Ocean Channels Website – a web platform that presents our news in a powerful, elegant framework. STAY TUNED as the project moves forward.